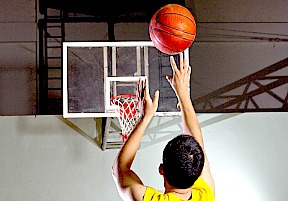 The basketball leaves the player’s fingertips and moves toward the hoop. The arch seems right and the crowd moves forward in their seats waiting for it to drop. But before it snaps the net, the ball hits the back of the rim, takes a bounce to the right, and falls to the floor. No basket. No score. The collective fans issue an audible sigh. The player tries again with the same result. She shoots from another spot on the court, but once more, she misses. Even for the best shooters, there are nights when their shots go cold. To compensate, a player may focus on her rebounding and defense. Or she may work to assist by passing the ball off to teammates. But for some players who are well developed at shooting, an off night is going to impact the team’s performance. That was the kind of thinking and determination that turned my father into an all-American basketball player when he was in high school. For him, basketball wasn’t just a game. At some point when he was still in elementary school he determined that he was going to become good enough to earn a college scholarship. My father was one of six in a family where no one had graduated from college, and by the age of 11, he had already determined a degree was something he wanted and sports was the way to finance an education. So he practiced his shooting skills. While growing up in a small town in Montana, my father would often shovel snow off the public outdoor courts in order to practice. Even the harsh effects of weather would not deter him from working toward his goal. And by the time he was in high school, he had turned into the kind of player that lead his team to win a state championship title. He was offered full ride scholarships at several schools. Just like all players, my dad had good games and bad games. There were days when he made most of his shots and days when he struggled. But as someone who was banking on basketball as his ticket to school, he only saw one option when his shot went cold—keep shooting. Last year I felt like I was in the middle of a bad game. I was missing a lot of the shots I was taking in my career and personal life. Again and again, I found myself making attempts that didn’t provide the satisfaction of a sunken basket. In each case I was using the experience and skills that had worked for me previously but I wasn’t reaching the same level of past success. In self-help author Karen Salmansohn’s book, Bounce Back, she calls a period of time when things just don’t seem to be going right “the vortex.” Most of us will experience this feeling at some point—the feeling that we have stepped into an alternate universe where everything is going wrong. And that’s when we’re faced with a decision that my father might put in the following terms: we can either quit playing or keep shooting. So no matter how bad or frustrating things became for me last year, I just kept shooting. And pretty soon, I was putting points on the board again with positive hits in all areas of my life. While my father’s advice can be used as we encounter unexpected challenges in our own lives, we can also use the “keep shooting” philosophy to help our nieces and nephews in our role as Aunties. Though related to basketball, this idea of determination can provide inspiration when nieces and nephews experience difficult times and make attempts but fail physically, mentally, or socially. Whether it’s dance or sports or fitness, kids will be faced with times when they physically struggle to achieve. During those times, it’s good to think about Michael Jordan, who used failure to fuel the work that eventually made him legendary. For inspiration, you can show them the Michael Jordan and Nike commercial in which he states “maybe I led you to believe that it was easy when it wasn’t.” Physical success requires a mindset of determination whether the goal is personal best or a high level of success. Naturally, some subjects are easier than others. Some concepts and abstractions are more easily understood and absorbed. Putting aside situations in which a learning disorder is involved, there will be times when schoolwork becomes more challenging. During those times our nieces and nephews may find they need to put in additional hours with their homework, seek help or tutoring, and find additional resources to master their studies. Riding the social ups and downs that kids usually face is not easy. And whether it’s with their friends or their first romantic interests, nieces and nephews will likely encounter social rejection at some point. They may not know yet that not everyone we encounter will like us, no matter how we try to gain their interest or approval. As Aunties, we can help them understand that sometimes they need to keep looking for the friends with which they will form a natural bond.